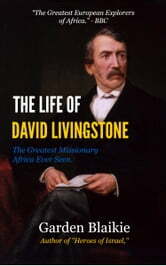 The life of David Livingstone by W. Garden Blaikie is mostly from his unpublished journals and correspondence in the possession of his family and contains over 40 illustrations. The purpose of this work was to make the world better acquainted with the character of Livingstone. His discoveries and researches have been given to the public in his own books, but his modesty led him to say little in these of himself, and those who knew him best feel that little is known of the strength of his affections, the depth and purity of his devotion, or the intensity of his aspirations as a Christian missionary. The growth of his character and the providential shaping of his career are also matters of remarkable interest, of which not much has yet been made known. Much pains was taken to show the unity and symmetry of his character. As a man, a Christian, a missionary, a philanthropist, and a scientist, Livingstone ranks with the greatest of of men, and shows the minimum of infirmity in connection with the maximum of goodness. Nothing can be more telling than his life as an evidence of the truth and power of Christianity, as a plea for Christian Missions and civilization, or as a demonstration of the true connection between religion and science. With so much material, it would have been easier to write a life in two volumes than in one; but for obvious reasons it has been deemed desirable to restrict it to the present limits. W. Garden Blaikie wrote one if not the fullest and most lively account of the personal life and ministry of Dr. Livingstone that has ever been put out. He gives the reader a real feel for the struggles and the joy that Dr. Livingston experienced, as well as a true atmosphere of the ages in which he lived. By the end of the book not only is the reader fully acquainted with Dr. Livingston, but one feels as though you know him.